Open your Guild Bank. When things are all loaded up, you'll get a button on the bottom left. If there's nothing to stack, you'll only get Rescan (which you can use to recheck the bank for new things to stack). If you get Roomba, just click on it and Restack will start. Roomba ignore existing items in your inventory, and only restack guild bank items. 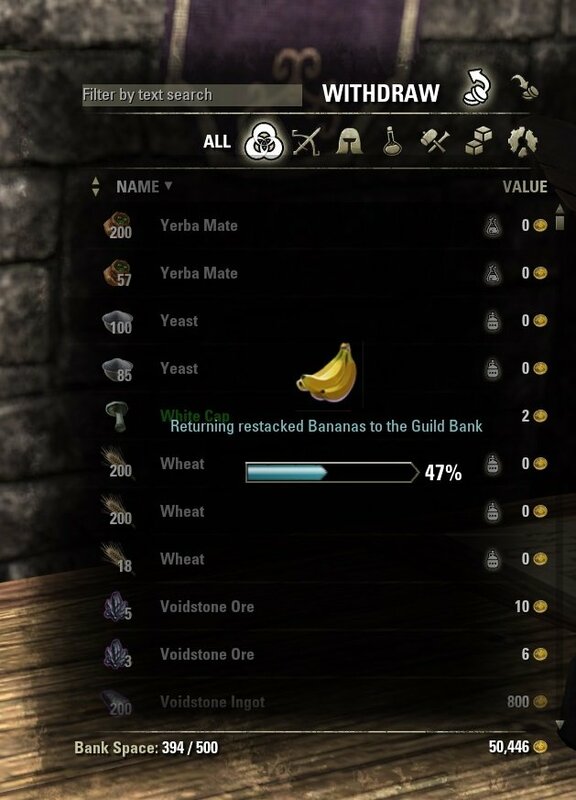 If you exit out of the guild bank before the stacking is complete you will retain the current stack of item you were in the process of stacking. Action can also be Keybinded and more options are available in Addons Settings. - Update 21 Wrathstone compatibility. 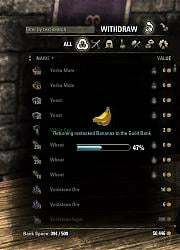 This version is compatible with both Wrathstone PTS and Murkmire live. Gamepad users must define the Roomba keybind position to "Center" or "Right Side" in order to work, because "Left Side" is already full of bindings in Gamepad Mode. If you switch between Keyboard and Gamepad often, You should use "Right Side" as it's compatible between both modes. For new Roomba users in Gamepad mode, keybind is set to center. As you can set multiple keybinds for a same action, you can bind Romba bindings in both keyboard and controller key if you want. - Added a rescan before each restaack to avoid having restacking iif new duplicates were added between scan and stack. - Roomba is no more tab dependant. It will always scan and restack your WHOLE bag/bank/GBank. - Added option panel & its librairies. You can now choose if Roomba will be enabled or not at Guild Bank, Bank and in your bag freely. - Roomba buttons has been merged. If you got something to restack, Button will just display "Run Roomba" instead of "Rescan bank/bag". Once its finished, Run Roomba transforms back into "Rescan bank/bag"
- Fixed two tiny random bugs that may pop an UI error randomly. - Fixed Keybindings if you use another addon which add its keybinds. - Roomba will try to retry (10 times) if your restack is awaiting another pending action from guildbank. - Roomba was disabled if your 1st Guild doesn't get its Bank. It will now be correctly disabled if you doesn't get privileges to Withdraw/Deposit on the actual bank you're looking at and enabled if you got permission. - Added compatibility for users who do not use official Launcher (Mainly RU/ES). - Developpers: 3rd party addons can now use function Roomba.WorkInProgress() to know if Roomba is actually restacking to prevent Auto-Destroy of items. 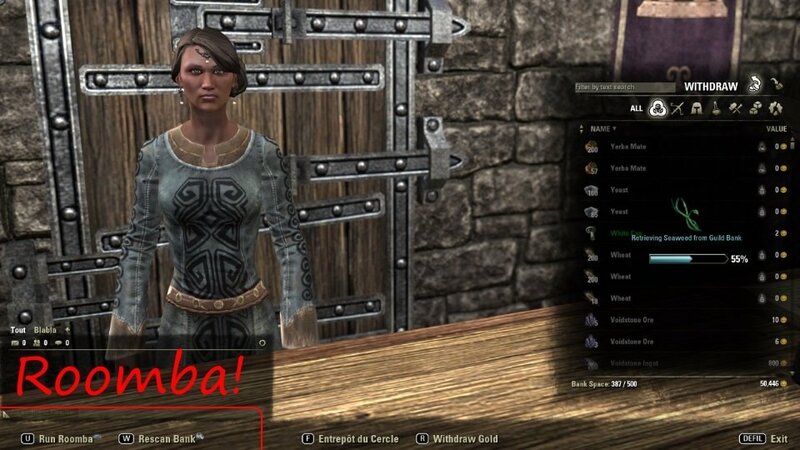 I've tried updating all of my other addons and then reactivating LibSavedVars and Roomba and it always crashes ESO. Nothing's really changed, I'm using the same addons I've used in the past. Is there a setting to STOP Roomba from starting to stack the second you open a guild bank? I'd REALLY like to not have to wait for it to lag it's way through a stack job just to deposit one item! It's getting ridiculous! Roomba itself does not automatically stack when you open the guild bank. Stacking is always opt-in, either via keybind or button press. Have you tried disabling all other addons except Roomba to see if the behavior persists? I suspect another addon is doing this. Does anyone else experience lot's of stopping and starting and long pauses with Roomba and their guild banks? It's infuriatingly slow for me. Deleted my previous reply because I got it to work - update everything and delete the saved variable log. Just found out that the saved variables lib stops game from loading therefore making roomba inactives as cannot select that lib as it crashes game as well. Has anyone found a workaround for getting Roomba to work? Someone in one of my guilds says theirs works, but not sure how they got past the saved variables issue. Thanks! This should now be fixed in version 16.1. I thought maybe I could see what was wrong and patch it but sry I don't know what needs to be done. I quit the game, deleted saved vars and logged back in, still the same UI error. At the moment Roomba causes the game not to load on the PTS. Had to disable Roomba to load up the game. No error codes are being shown. Thanks for the report. I've seen that behavior on PTS too, but didn't know which addon was causing it. I'll see if I can track down the problem code. This is now patched in version 16. Last edited by silvereyes : 01/27/19 at 02:11 AM.